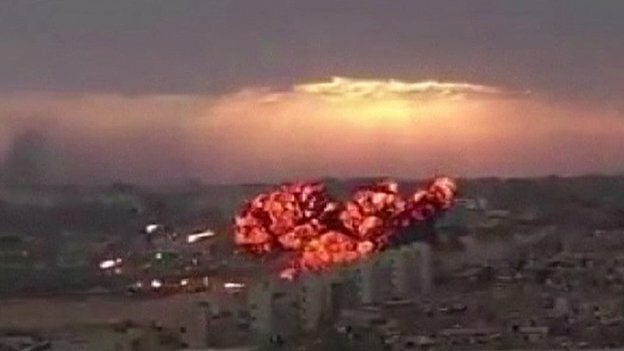 A Libyan military jet has crashed in the eastern city of Tobruk, causing a huge inferno and killing a child and at least two other people, officials say. The jet hit a block of flats near the new parliamentary building after developing a “technical fault”, a security official said. The jet was controlled by forces loyal to ex-General Khalifa Haftar who have been battling Islamist militias. The Islamist-linked Libya Dawn group seized the capital, Tripoli, last week. 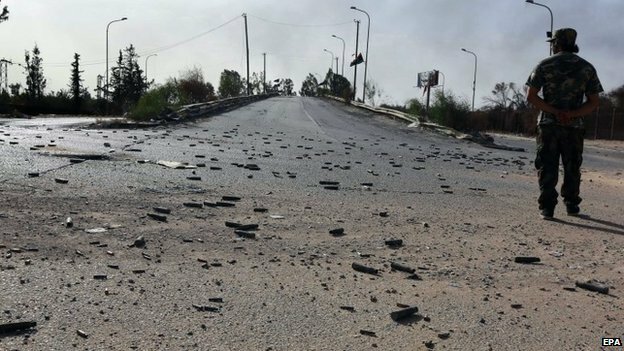 Parliament had earlier relocated to Tobruk, more than 1,000km (620 miles) away, because of the deteriorating security situation in Tripoli. Witnesses said the jet was flying at a low altitude and smoke was billowing out of its engine before it crashed into an apartment block and burst into flames, the AFP news agency reports. It came down on Tuesday around 1km (0.6 miles) from the seat of parliament, killing at least two residents and a co-pilot, Reuters news agency reports. The dead included a child, but the co-pilot survived, an unnamed security official is quoted by AFP as saying. Libya has been hit by instability since an array of militia groups, backed by Nato air strikes, overthrew long-serving ruler Col Muammar Gaddafi in 2011. The militia groups, many of whom are allied to rival politicians, have been fighting for power among themselves. Posted on 3rd September 2014 by newsafrica. This entry was posted in Africa, Democracy, Islam, Libya, Terrorism and tagged Islamism, Khalifa Belqasim Haftar, Libya, Militia, Muammar Gaddafi, Reuters, Tobruk, Tripoli. Bookmark the permalink.